While I don’t have any flight training, since the plane I’m stealing is already running, I manage to figure out the basics before anyone has a chance to stop me. Despite the shouts of anger from what must be the pilot, I get it going down the runway, and up into the air. Using the plane’s radio, I also figure out how to get ahold of my mechanic coworker, who says she know a perfect place in the mountains to let the bomb wrapped around my neck go off, and that she’ll meet me there. As I’m flying to my potential salvation, though, I start doubting this whole plan. The guy I put on the hitlist is an outlier, and the only one of his kind. I can’t damn anyone else to this; not when I have a choice. Like I’ve said, my life doesn’t mean anything, so maybe it’s best if I end it now. I decide to find a nice safe spot away from people to fly in a holding pattern, and let the clock run out, satisfied with my decision, but the next two hours comes up, and nothing happens. Was the guy lying, or am I out of range all the way up here? Maybe he never expected me to find an aircraft. I might survive this yet. I circle the place where my friend wants me to land, and take some time to read through the flight manual. The landing procedures sound intuitive, but this isn’t something I can just try out; not when there’s now a chance to get out of this pickle. By the time I land—in fine fashion, if I do say so myself—yet another two hours comes and goes, and still no explosion. Not willing to taking more of a risk than I have to, I keep jogging, all the way into what looks like a gold mine, or something. My mechanic is already waiting for me there with her tools. She takes some time to inspect the device around my neck before agreeing that we really are out of range, and the terrorist who did this must have intended to stay close enough to me, because he hadn’t programmed a distance failsafe. He had, however, installed an anti-tampering feature, which meant it would explode as soon as she got if off. She determines that she can freeze it, and give us a buffer of up to three seconds. That doesn’t sound like enough time to me, but she promises that her plan will work. 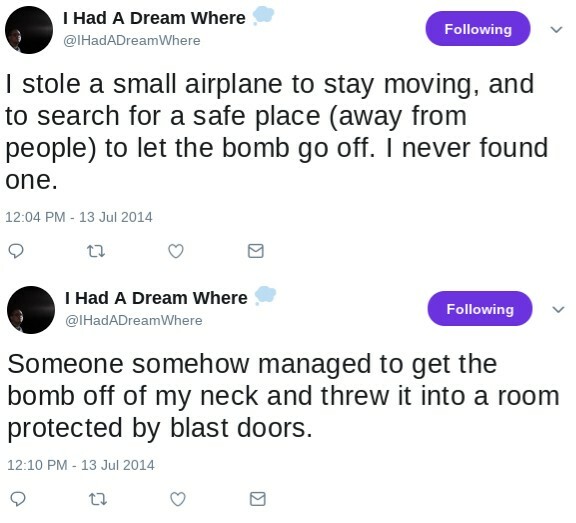 She takes out a can of dusting air, and sprays it onto the choker, then she quickly breaks the clasp, and tosses the bomb into another room. She isn’t able to close the blast doors all the way, but it’s enough to protect us. It was over, or so I thought. A man suddenly appears out of nowhere and snaps a different choker around my friend’s neck. “Congratulations on being the only one who managed to get this thing removed.” He hands me a gun, a choker bomb, and a detonator. “Now it’s your turn. I tell you the same thing I tell everyone. You have one day to find the man you put on the hitlist. Put the bomb around his neck, and give him the same instructions you were first given. If he dies, she lives, and so do you. Or you can kill him right away, along with yourself, and end the cycle of violence forever. You choose.” I don’t hesitate to shoot the man in the head. Then I grab the can of air and tell my friend to walk me through how to get her choker off.